When the air turns crisp, it prompts a variety of changes. Summer clothing is exchanged for fall sweaters, and eventually, heavy duty winter gear. We switch out screen windows for glass panes and shore up insulation to ensure that our homes stay warm and toasty. The change of season also prompts the need for changes in the garage. 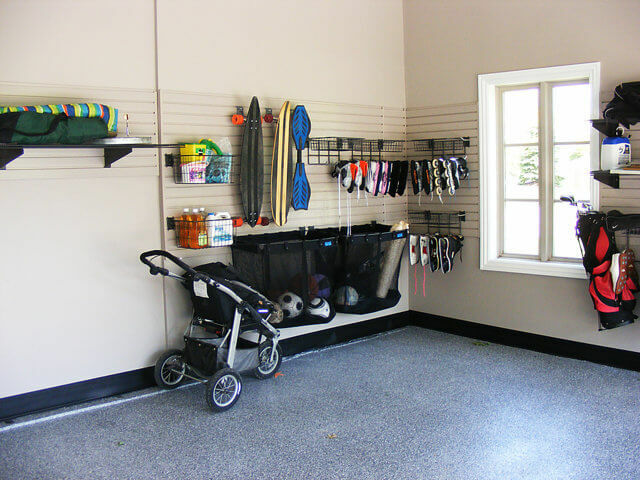 Once you’ve gotten your garage ready for winter, it’s time to tackle another change-of-season task—stashing away all of your family’s summer sports gear to make room for winter sports equipment. Each member of your family may participate in a variety of sports, each requiring its own long list of accessories, big and small. 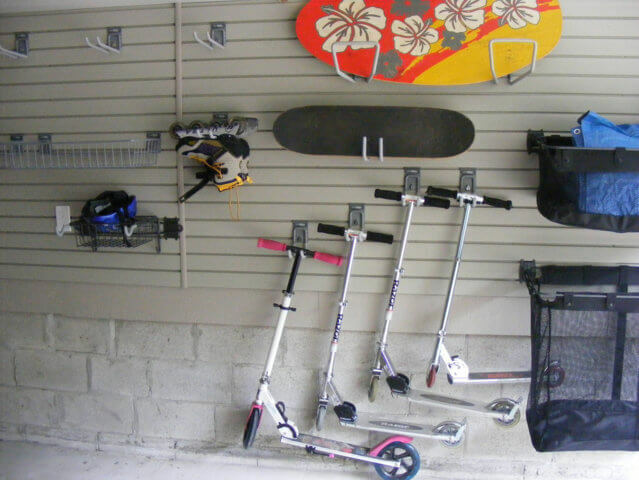 If the garage is the primary entry point for your family, your garage is likely jam-packed with balls, bats, skates and a variety of other items. 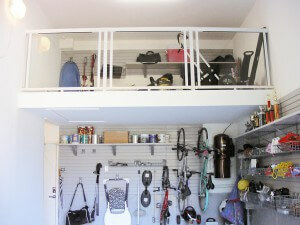 During the summer, bikes and sports equipment often take over the garage. However, with the impending arrival of winter, you’ll likely want to get your cars parked inside the garage. Let’s examine a basic plan that will help you store winter sports equipment in your garage so that you’ll be prepared to go zooming down the ski trails at a moment’s notice. Just like a championship-bound sports team, an organized garage has a solid system as its foundation. In this case, there should be at least two: task-related zones and a wall organization system. 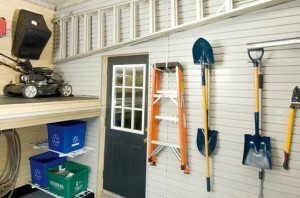 In past posts, we’ve discussed the importance of creating dedicated zones in your garage.Creating separate areas in your garage for each of the tasks performed, or each type of item stored there, is an essential component of an organized garage.Once you’ve reorganized your garage by creating spaces for automotive accessories, yard tools and other commonly-used items, it’s time to assign a spot for the individual items in each category. This is when a wall organization system becomes invaluable. A wall organization system, like slatwall, provides dedicated storage spaces for all of the items in each zone. These systems are used in conjunction with complementary hooks, baskets and shelves, which come in a variety of sizes. Dedicate a basket or shelf to a single sport or a specific family member. The individual storage accessories can be configured, and re-configured, in countless ways, allowing you to customize the system to fit the changing needs of your family. During the warm months, perhaps softball, soccer and lacrosse equipment took center stage. Now it’s time to make room for sleds, ice skates, hockey equipment and skis. If you already have a wall organization system installed, this task is simple. 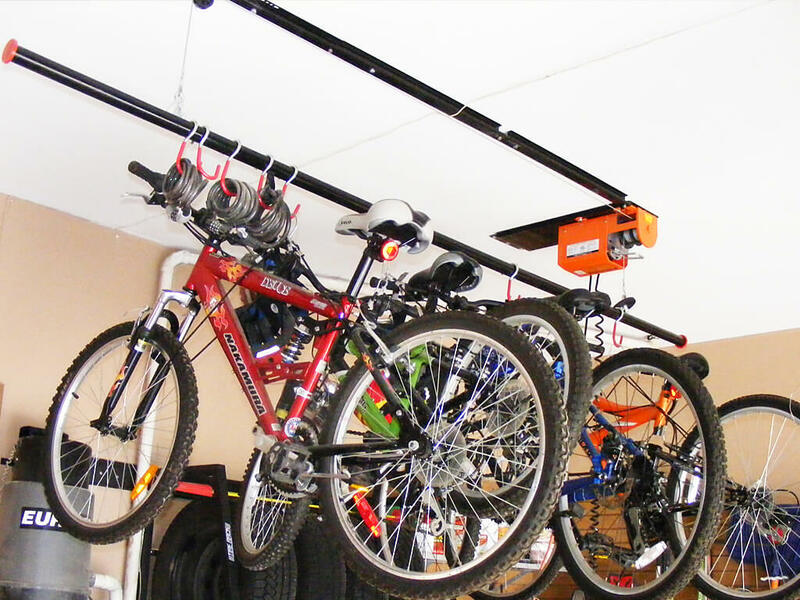 Unhook the baskets and hooks for summer sporting goods and relocate them to a less prominent area in the garage. Then switch the baskets and hooks for winter equipment to a position that makes them easily accessible. If you don’t have room to store both summer and winter equipment along the wall at the same time, consider storing off-season items in overhead storage bins or platforms. This is an ideal place to store items that are seasonal or seldom used. 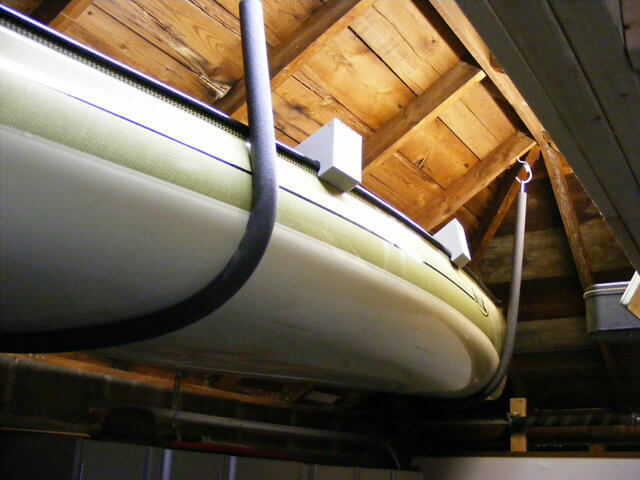 If your garage isn’t equipped for overhead storage, or the space there is already reserved for other items, off-season sports equipment can be stored in the basement or in a closet. What about large or irregularly-shaped items that tend to eat up the limited real estate in your garage? 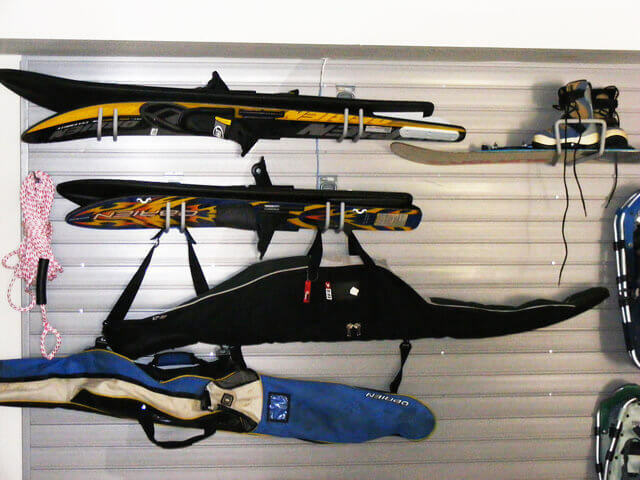 Wall organization systems, like slatwall, have you covered with hooks or specialty hangers that can accommodate snowboards, snowshoes, hockey sticks and other large items. Need space for bulkier items? 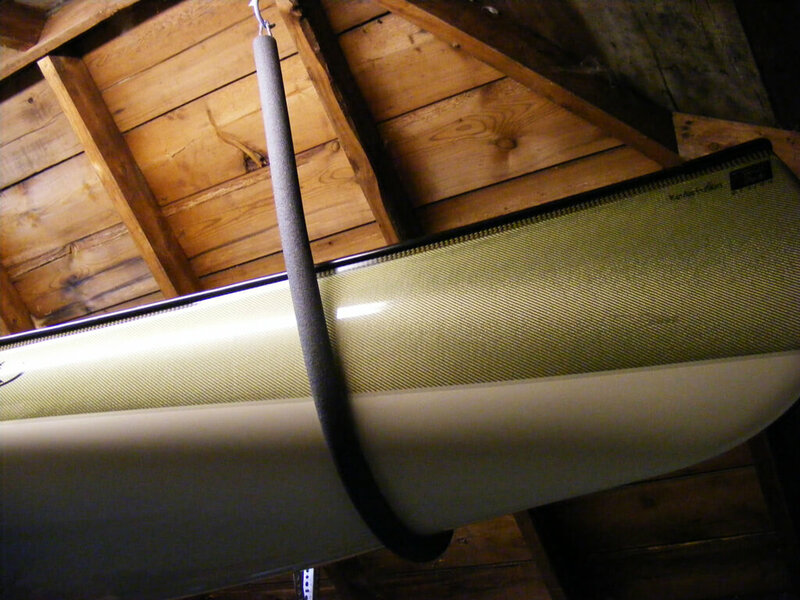 Try a custom overhead sling to make storing and loading your Thule a snap. Before you put everything away, take a few moments to prep the equipment for the season ahead. Wipe down skis and examine them for any damage. Check skates for broken laces or loose blades. Make sure the runners on sleds are securely fastened. Now you’re ready for the season ahead. A garage wall storage system is extremely versatile and highly-configurable. When used in conjunction with dedicated zones, it creates the foundation for a truly organized garage that can accommodate your family’s active lifestyle any time of the year. Best of all, items will be stored off the garage floor leaving room for the real star of the show—your vehicle. Want the flexibility a wall storage system can provide, but too busy to install one yourself? Contact a garage renovation specialist to discover creative ways to store your sports equipment. We’ve settled into fall and the air is turning crisp and cool. Though most of us would prefer to reminisce over how we spent the summer, it’s time to give serious thought to preparing for winter. It was the coldest winter Toronto has experienced in twenty years. The harsh winter caught many of us unaware, and left homeowners, businesses and governments reeling from the unexpected impact and costs. Most homeowners realize how essential it is to winterize their homes, but don’t forget about your garage. It needs winter weather prep, too. What can you do to prepare your garage for the snowy winter ahead? Here are four steps that will help you get your garage ready for winter. During the activity of summer it’s easy for the garage to become a family dumping ground. Maybe you’ve even resorted to parking your vehicles outside, rather than vying for space inside the garage. However, with snow and cold weather headed our way in the coming months, now is the time to carve out space for your vehicles and all of your winter weather supplies, like shovels, salt and your trusty snow blower. Begin your winter weather prep by cleaning out your garage. Sort through all of the items stored in your garage. Honestly assess which items are needed and which should go. Be brutal. Toss broken items, including the ones you’ve been planning to fix for the past five years. Donate items in good condition that are duplicates or that your family no longer uses. Do I trulyneed this item? How likely is it that we’ll use it again? If I’m not using it, why am I really holding onto this item? If it’s broken, is it worth fixing? How likely am I to fix the item (or get it fixed)? Which is more important: holding onto this item or parking inside the garage? Once you’ve pared down the volume of items stored in the garage, it’s the perfect time to spruce it up. Sweep floors, dust for cobwebs, clean the garage door and give the floor a good scrub. What additional items need to go into the garage? Is there room for the snow blower? Where should each item be placed for easiest access? Map out a plan that will allow you to safely store all items while also accommodating any vehicles you’d like to park in the garage. Floor space is at a premium in the typical garage. Don’t limit yourself to perimeter floor space. 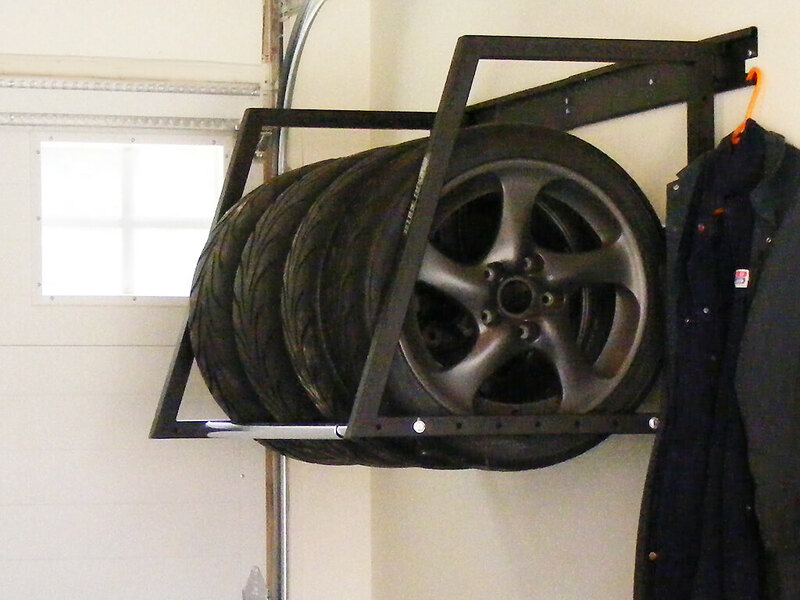 Install a wall organizer system, or have one installed by a garage interior design expert. Storing items vertically in baskets, or on shelves and hooks, reserves floor space for larger items and for vehicle parking. Still need more space? Look up. 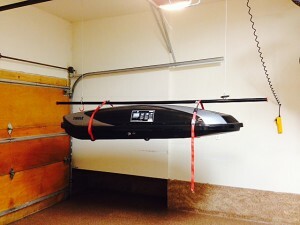 If your garage has wasted overhead space, as most do, you could add valuable storage space by getting overhead storage platforms installed.Before you give your plan the green light, make sure it includes task-related zones. While creating your plan, you considered which items should be grouped together. This question is essential and deserves further discussion. Creating task-oriented zones will help keep your garage organized throughout the year. Carefully consider all of the activities that take place in your garage. Keep seasonal and related items together. Create a car care zone, one for yard care and another for winter sports gear. Shift winter gear to a prime space and store summer items where they are less accessible. 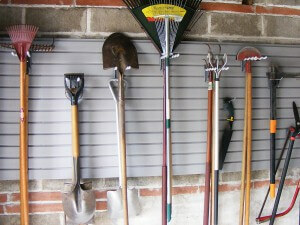 Ideally, winter yard maintenance equipment and supplies should be stored close to the garage door for easy access to the driveway. However, not all sidewalls can accommodate a snow blower while still allowing room to park vehicles inside. If this is the case in a two-car garage, try storing the snow blower on the back wall near the center of the garage. This will allow you to exit the garage between the vehicles parked inside. Now that your garage is decluttered and organized, it’s time to make sure that everything is ready for that first icy blast of Arctic air. Check all moving parts of the garage door. Get any missing or broken parts repaired. Lubricate garage door rollersand hinges for smooth operation all winter. Ensure that the safety reverse sensor is functional. If not, adjust sensors or have them repaired. Drain water from hoses, purge sprinkler system and shut off water supply to exterior spigot. Take advantage of cool, comfortable fall temperatures by preparing your home and garage for the winter ahead. Once you’ve decluttered your garage and created a plan of action that includes task-oriented zones, it’s time to put that plan into action. Store any items that can’t be stored vertically or overhead around the perimeter of your garage. Stack or nest like items, like flower pots or storage bins, to maximize space.